In ancient times humanity possessed an innate knowledge of the spiritual foundations of existence. Such knowledge could be acquired through inwardly accompanying the cycle of the year and its connected great seasonal festivals. But this instinctive knowledge had to be lost in order for human beings to discover individual freedom. In our time, as Sergei O. Prokofieff demonstrates in this comprehensive work, "... this knowledge must be found anew through the free, light-filled consciousness of the fully developed human personality". Tracing the spiritual path of the yearly cycle, Prokofieff penetrates to the deeper esoteric realities of the seven Christian festivals of Michaelmas, Christmas, Epiphany, Easter, Ascension, Whitsun and St John's Tide. Basing his research on the work of the twentieth-century initiate Rudolf Steiner, he reveals how these festivals are spiritual facts that exist independently of religious traditions and cultural customs. Working with the festivals in an esoteric sense can provide a true path of initiation, ultimately enabling an experience of the Being of the Earth, Christ. 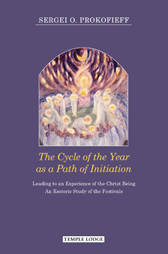 The journey of study through this book can thus lead the reader to an experience of the modern Christian-Rosicrucian path, along which "... it is possible to take the first steps towards life in partnership with the course of cosmic existence". SERGEI O. PROKOFIEFF, born in Moscow in 1954, studied fine arts and painting at the Moscow School of Art. He encountered anthroposophy in his youth, and soon made the decision to devote his life to it. He has been active as an author and lecturer since 1982, and in 1991 he co-founded the Anthroposophical Society in Russia. In Easter 2001 he became a member of the Executive Council of the General Anthroposophical Society in Dornach. He is the author of numerous books available in many languages throughout the world.